For that special someone who has everything! 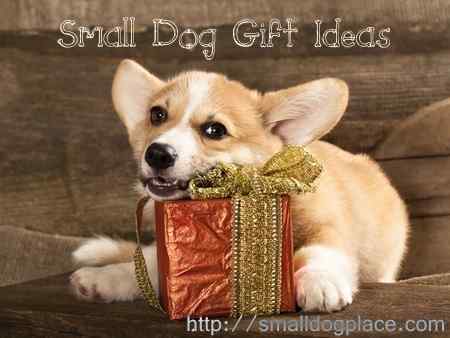 Why Choose a Small Dog Gift for that special person on your holiday list? If you’re a dog lover or know someone, a dog-related gift can be the perfect way of saying, “I truly understand you—I know what is important to you.” This is a way of validating a person and making them feel appreciated. They may even have some K-9 help in opening their gift! Christmas is not the only time a gift is welcomed, consider other holidays and birthdays. The nice thing about giving a dog or breed related gift is the wide variety of items available and in a price range that will fit anyone’s budget. Of course, it’s OK to spurge on yourself once in a while. There are so many different dog related gifts that is often hard to decide which one might be perfect for the one on your list. Don't limit your choices to mouse pads or note cards, get creative. A dog lover that also happens to like jewelry? A match made in heaven! There is always a book lover on your holiday gift list. Choose one about a special dog. Games are a favorite at any age. If you have a special breed in mind, why not honor a person with something that we know they will cherish for years to come. I’ve helped with the process by scanning the internet for you to find the perfect gift for that special dog lover on your list. The more common the breed, the more selection you will have, but even the rarest dog breeds in the world are gaining popularity outside their native country and a gift honoring these dogs is especially cherished. You can be sure that if more than one person own a particular dog breed, there will be a breed specific gift waiting for them. And for the Puppy Buyer to Be? 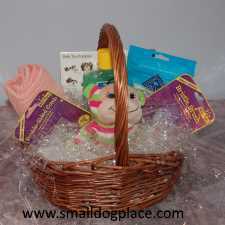 If you know someone who is looking to adopt or purchase a dog, why not give them a little head start with a puppy basket. All the essentials wrapped up in a cute basket. Or, maybe you prefer to make your own? Or, maybe you know a child wants a puppy but the time is just not right. Would a beautiful plush replica work in the interim? Don’t forget to add a little item for yourself. 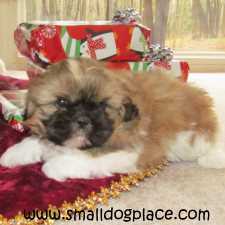 A Real Live Puppy for Christmas? Parents are often confronted with a child that has one thing on their Christmas list...a puppy! There's nothing like a little pressure here. Introducing a new puppy on Christmas Morning may not be the best idea for you or the puppy. If you have your heart set on giving a four-legged gift this year, do a little homework. Before you go out looking for that Christmas puppy, read this article first. Have a young friend, say a child or a grandchild on you gift-giving list? 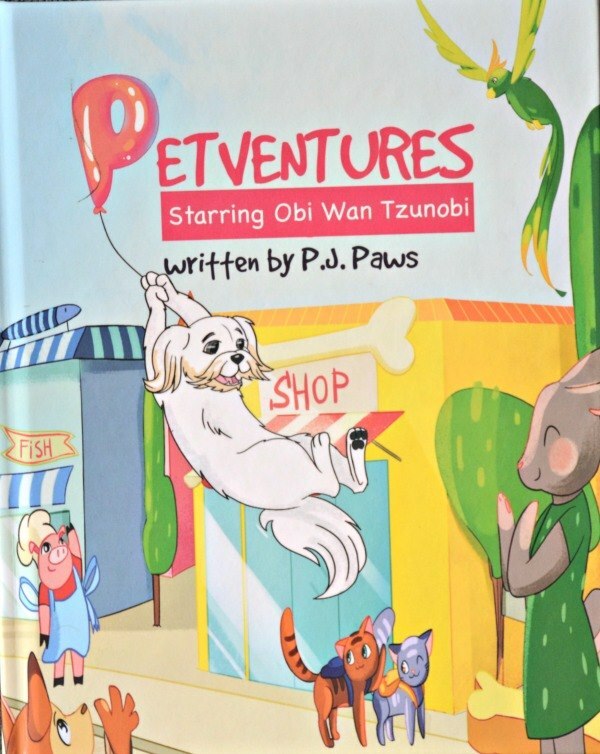 Here's a unique gift that is sure to please the youngest dog lover, a personalized book all about a pet and his favorite person. With clever rhymes, colorful illustrations, and a upbeat plot, a toddler, preschooler or early elementary aged child would love a gift all about him and his dog. And, yes, that little white dog hanging from a balloon is my white Shih Tzu, Obi Wan Tzunobi. Learn how you can personalize a child's book using your child's name, city, dog's name and pictures. Read more. I admit, I'm a collector, but this is almost angelic in nature. Notice what she is holding in her arms. OK, maybe not diamonds, but jewelry does make a statement. Here is an item for a dog lover. Here's a book with a new twist. Written by a dog for a dog! Human translation required. No dog lover should be without this humor. Clothing is always a great bet, whether it is Tees, Sweatshirts, Hats or even socks. Whether you're looking for breed specific wear or specialty items specific for the dog lover, these gifts are always a great hit. If you love dogs and the game of monopoly, this could make for a fun family game night. Instead of purchasing property, you purchase dogs. A cute game for children 8 and up. More Game Ideas for all ages. For all ages, these cute cards include pictures of 54 breeds, and are fine for all card games, and make a great inexpensive gift for that special dog lover. Cute sayings fill up these note pads. There so many different themes, but naturally we picked dogs, because they're top on our list. Everyone needs a thank you card now and again, so why not give these inexpensive small dog gift to that canine lover on your list. M2979 Hot Dogs: 10 Assorted Thank You Note Cards Feature Vintage Dog Illustrations, w/White Envelopes. There are more breed specific gifts on each of the dog breed profile pages.